Did you know that pigs are highly intelligent? Scientific studies have shown that they have better memory and cognitive problem solving skills than a 3-year-old human. Pigs also feel remorse, empathy, and affection; they are playful and often show a silly sense of humor. 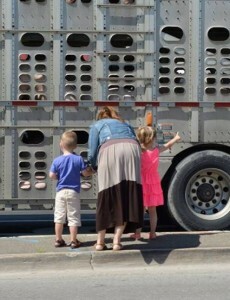 Most people are unaware that during transport to slaughterhouses, pigs are crammed into trucks. In warmer months they suffer extreme distress from overheating and dehydration – in the winter, they arrive at the slaughterhouses with frostbite. Most of these pigs are only 4-6 months old – they are confused, frightened and in pain. This September, 2014, I am dedicating 50% of all sales of The Chain to help Toronto Pig Save – a dedicated, grassroots organization that seeks to put “glass walls” on Toronto are slaughterhouses. 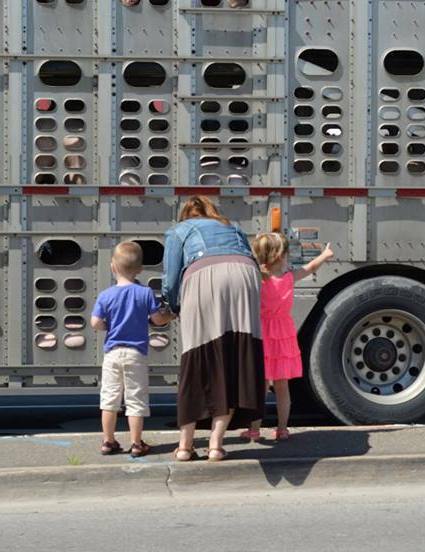 They have inspired an international Save Movement to help all farm animals. Watch below some of their work. Bearing Witness is the beginning of awareness. Thank you for donating your money to this project. I think I came vegan from the womb 58 years ago. I knew instinctively I think that that meat arrived at our table through a hideous process of torture and abuse.